Branedy – see the 3rd last paragraph in this post to see how IE8 compares on Acid3. If anybody is trying IE8 would recommend that they do so within VMWare or some other virtualisation tool (like Paralels for Mac). Installed the *beta* (yes I was asking for trouble) on Windows Vista with no end of problems. Thankfully the System restore feature in Vista let me (eventually) roll back the state to about 2 weeks ago with no data lost. Thanks for the screenshot, it looks a lot like IE7. But hopefully its better than IE7, what i want from a browser is something fully custumizable, like IE6. Though the tabed browsing looks pretty good and also that its easy to open a new one (mouseclick). 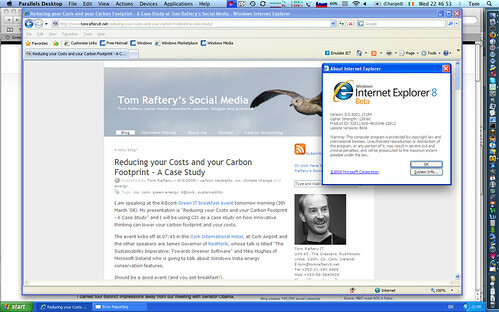 Still for now I will stay with Firefox and IE6.